Welcome to Film Fashion Friday!! 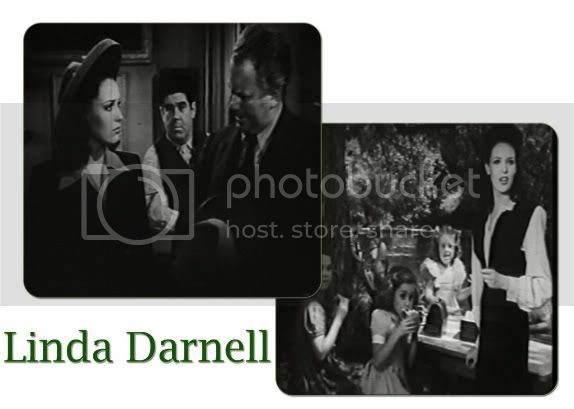 This week's film is a Linda Darnell picture from 1943. It was released in January, so much of the fashion is coming out of 1942. There is no costume designer/director for this film, which I am not too surprised since this is more of a B film. The director is Sidney Salkow and he would go on to direct a lot of TV shows -- most notably "The Addams Family." Although this film is only 75 minutes long, there are many costume changes that display great wartime fashion. Linda Darnell has some really stylish hairstyles going on as well. I am loving the jumper she has on in the opening scene of the film. I have been wanting one of these for a long time....still no luck yet. There is a grey one on eBay at the moment and I am considering it!! 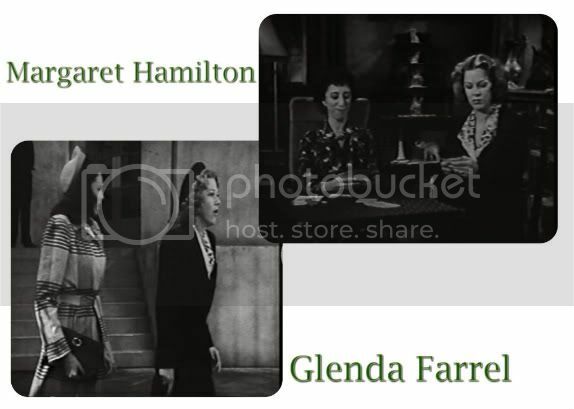 City Without Men has a super supporting cast of some lovely Hollywood stars, including Margaret Hamilton and Glenda Farrel. Both give wonderful performances. This film is available on dvd and Netflix. However, I should warn you that it is not a good print and the sound is pretty muffled. It is still a great film to watch for both the fashion and the plot. Plus Linda Darnell is just awesome...I LOVE her!!! 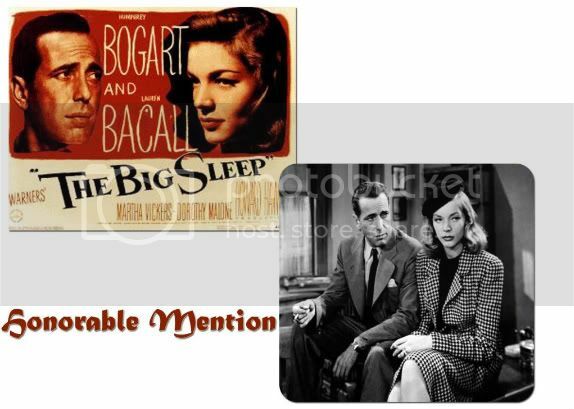 My honorable mention this week is The Big Sleep. Another grand 40's picture. It's hard to resist Bogie and Bacall. Lauren Bacall has some awesome outfits and there are a lot of female characters in pants. I especially noticed the hats that the extras were wearing...they were fabulous enough just to watch the films for that reason alone!! 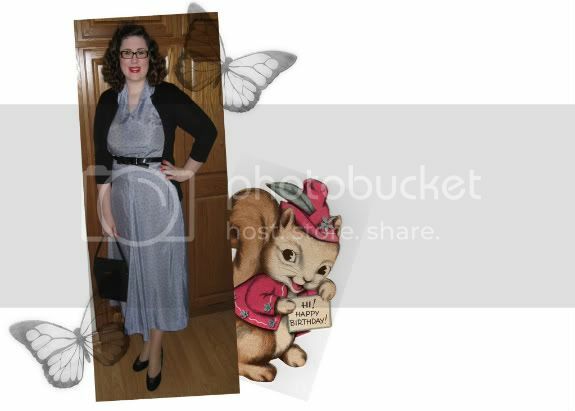 Today is my birthday and I had planned on wearing my 40's robin egg blue suit but the weather here was so nice, so I decided to take this dress for one more spin before the snow comes. I love this dress. It is cut on the bias, making it drape beautifully. It has purple polka dots all over it, giving it a great contrast between that and the periwinkle blue. Black is always a "go to" color for me and I like the added contrast of the pastels and the stark black accents. I set my hair in sponge rollers last night and I really liked the out come of the setting I did -- one that I had never tried before. If anyone is interested, I can do a post on it. I did a modified take on one that LisaFreemontStreet did on You Tube. She has a really great channel with lots and lots of tips. While surfing youtube the other day, I stumbled across this adorable old short film with Cary Grant and Rosalind Russell and just had to share it with you all. I really enjoy these little films that classical Hollywood stars made. They are extremely cute and show a lighter side to old Hollywood. I hope you all enjoy it and if you have any links to more clips like this, let me know!! 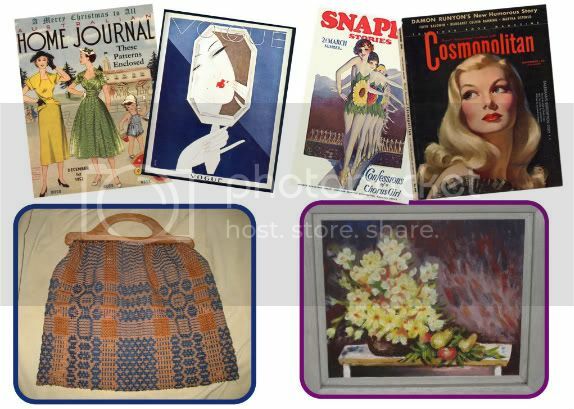 One of the many vast vintage items I collect is vintage magazines. I love to thumb through all the old ads and pictures and discover new recipes. I also really enjoy the cover art. I like how some magazines have photos for cover art, like LIFE; and some have a more artistic take, like Ladies Home Journal. I think one of the biggest reasons I enjoy collecting vintage magazines is because they are relatively inexpensive and normally easy to come by. The last two estate sales I went to didn't have any vintage magazines, however there were many other great items up for grabs. The sale I went to last weekend yielded the above; a beautiful painting ($2) and a vintage knitting bag ($4). The knitting bag has been on my list of things to look out for and the painting just kind of happened. I found it in the basement under a bunch of stuff and figured if the price was right I would buy it. I did get a few other items at the sale; some lovely linens, a super cute vintage apron, and some dishes -- something I can't seem to get enough of!! I sure do hope that I will have a lot of stage pace in my future kitchen and lots of dinner parties to make use of all these purchases!! I went to a bag sale today and picked up a few items. The most exciting was four strips of vintage shelf edging in the most beautiful rose pattern. I also picked up a bag of vintage iron-on embroidery transfers for my mom and I to share. She has already picked out her favorites! Hello lovely readers!! To introduce my new series, this week I am featuring a classic favorite that often gets talked about for its fabulous costumes. 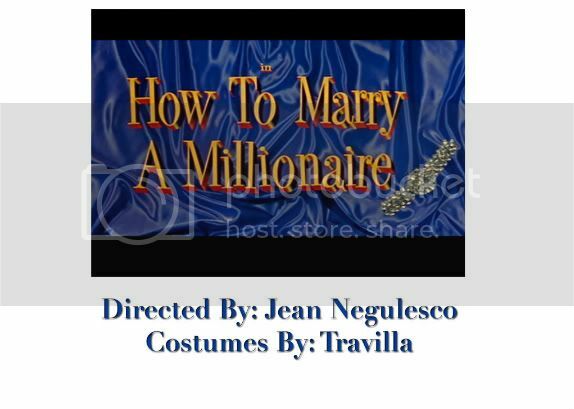 How to Marry a Millionaire features numerous ensembles created by Travilla. Travilla got his start in the film industry in the early 40's and continued to work into the 80's. He often worked with Marilyn Monroe and even did some of the costumes on the hit 80's tv show Dallas. 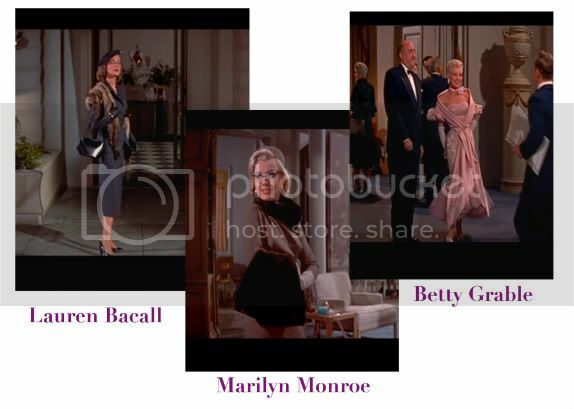 The film stars three wonderful leading ladies; Lauren Bacall, Marilyn Monroe, and Betty Grable who were all known for their keen style sense. 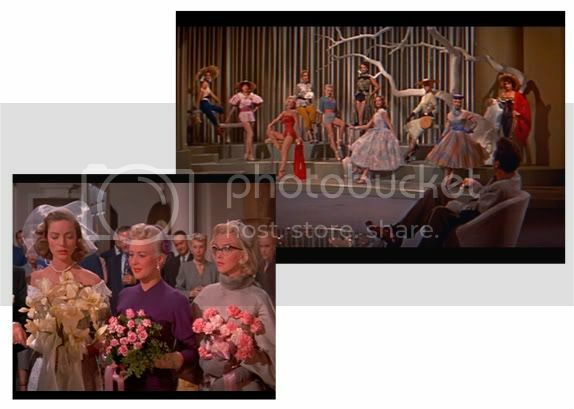 They all have about 4 or 5+ costume changes each throughout the film, each showing off some of the most fashionable clothing options for the 1950's. Each girl is always accessorized well and always beautifully put together. If you haven't seen this film before, it's a cute romantic comedy about three gold digging girls who are on the hunt for some millionaire men. Their journey in luring in the men provides much of the comedy. Besides the marvelous costumes, this film can stand well on its own for great witty dialog and some beautiful cinematography. One of my favorite parts in the film is the fashion show sequence. 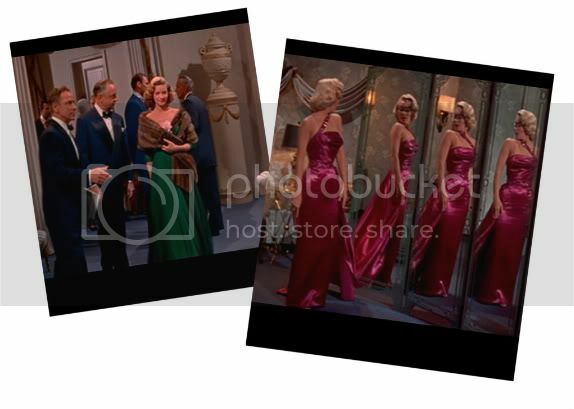 The models are wearing some of the more couture items for 1953 (the year the film was made and released). 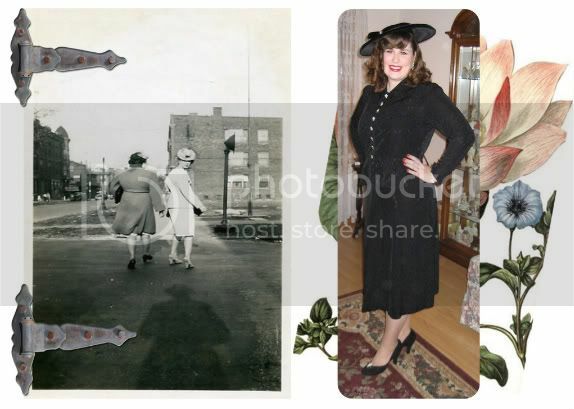 It's fun to see what was considered high fashion and it really gives us vintage girls some great ideas!! There is also a great scene in the powder room where the girls are primping themselves before joining the men at dinner. The set for this scene is really decadent and glamorous. I also really love the mirror shots. Pictured above is Marilyn, but there is also a similar one of Betty Grable that is just as fabulous! So that's my pick for this week. I wanted to start out with something readily available both on dvd and Netflix and easy to find at your local video rental place. I have also decided to feature at least one or more films each week as honorable mentions. These films will also be available on dvd or Netflix as well, but might be a little more difficult to find. This week since the main film was from the 50's, I wanted to feature a film from both the 30's and the 40's. 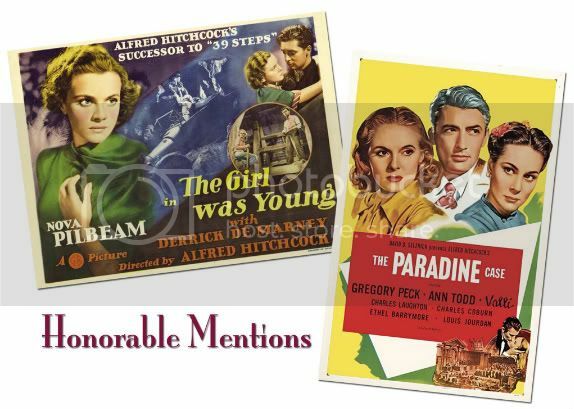 Both honorable mentions this week come from Alfred Hitchcock, "the Master of Suspense." The Young and Innocent is from 1937 and is a really great film. 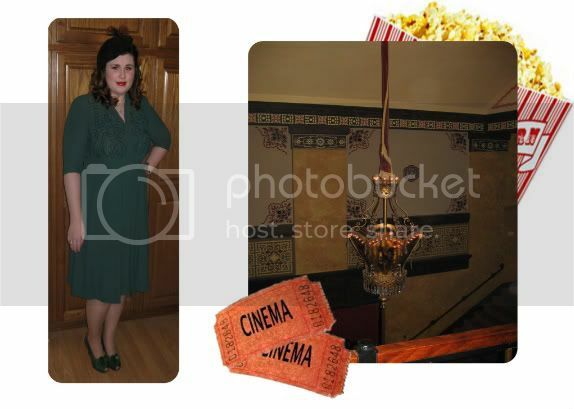 The main character on has about two or three costume changes, but they are some really outfits featuring classic 30's designs. The extras in the film are also well dressed. The Paradine Case is from 1947 and showcases some really great new look fashions. There are a few fancy dinner scenes that show off some really great formal gowns and for this reason, I feel it's worth watching..also if you enjoy a good courtroom drama. I hope you enjoyed the first week of these series and if you have any requests for a certain decade or star, let me know!! As I mentioned in my last post, I made a last minute change to my costume for the costume night at the Redford. I decided I wanted to wear this dress so I would get a chance to wear these heels and hat, both purchased over the summer. I also felt that the green matched better with my vintage mink stole than the black suit. I didn't take any pictures of myself with the mink on, but its a traditional brown one. If I had kept the blonde mink that I got with the other, I would have probably worn the suit again. Anyways, I love the combination of brown and green, so I was pleased with my outfit. My friend and I were pretty much the only ones who dressed up, but we both had a blast and got many compliments as well!! The other picture is of the inside of the theatre, right outside of the actual seating and between the lobby. The lobby is closed off by big red doors. The lighting fixture came from Europe and is period but not original to the building. There are three of them hanging and are quite lovely! As I am writing this post, my finds from the really great estate sale at the historic home are soaking in the laundry tub. I hope to have pictures up soon!! This past weekend was costume night at the Redford theatre. My outfit pictured above is actually from two weekends ago. My friend, Taylor and I didn't know that they had moved the films scheduled for that weekend to this past weekend, so we got all dressed up and drove all the way out there...only to find out the date had been moved. Regardless, I was excited I got to wear this suit. I got it over the summer off eBay and it is probably one of the best deals I have ever gotten on any piece of vintage clothing that I own. The suit with the shipping and handling cost me $8!!!!!!!! It is a perfect fit and a lovely cut...don't ya think?? I ended up wearing a different dress to the actual showing of the films this weekend. Pictures to come!! I also attended the most luxurious estate sale at the home that originally belonged to the Kresge family. I am assuming that the home was built around the mid to late 20's and everything was kept just as it was when it was built!! I have some pictures I pulled off the estate sale website that I will share later on this week, along with my finds. Two weekends ago, my friend Taylor and I went to see The Blob at the Redford and somehow these pictures never made it onto my blog! I believe I mentioned this blouse and skirt set in my last post. I got it at this fab estate sale two weekends ago. I was so excited to wear it for that night that I rushed home to wash it and have it dry in time for my outing that evening. It's handmade and cut on the bias. The buttons are little clear bows....so adorable!! I fell in love with the collar and just had to have this set. I knew that that weekend would probably be the only chance I would get to wear it since the weather was starting to change. But, living in Michigan...you never know what the day or week will bring. (It was in the 40's today and next week it's suppose to get to the mid 60's) Maybe I will get one more spin out of it before the snow comes! Before I end my post, I want to ask all my lovely readers their thoughts on something. I have been thinking about doing a weekly series on my blog in relation to vintage films and the clothing in them. I am thinking about calling it Film Fashion Friday. 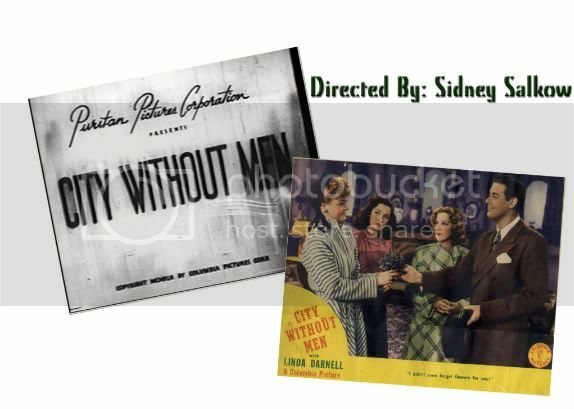 My idea is to talk about one or more films each week that were made between the 30's and the 60's (with the occasional current day film with period clothing) that have great clothing in them. All of the films that I will use will be available on DVD, VHS, or through Netflix; that way you will have easy access to them if you are interested in viewing them. I want to feature films that don't get talked about a lot, but showcase some really stellar fashions. Let me know what you think. If I get a good enough response I will start the series next Friday. It feels like I haven't blogged in forever. There has been what seems like an endless amount of film papers and film viewing I've had to do since the start of this semester. I have managed to go to a few estate sales and some films at the Redford in between all of my homework. Above is an outfit I wore to class last week. I was really pleased with how it all came together. The dress was old stock and still had the tags on it. It's a "Versatiler"....."The dress that goes everywhere and does everything" It's also suppose to feel like cashmere, but I don't agree (it is soft but not that soft). The shoes are a deep chocolate brown. I have been on a quest for the perfect brown vintage heels. I wanted suede and a 40's style. I found these at the last estate sale I went to for a whole $2.50 and they were everything I wanted and more. Definitely the cheapest pair of shoes I have ever purchased. 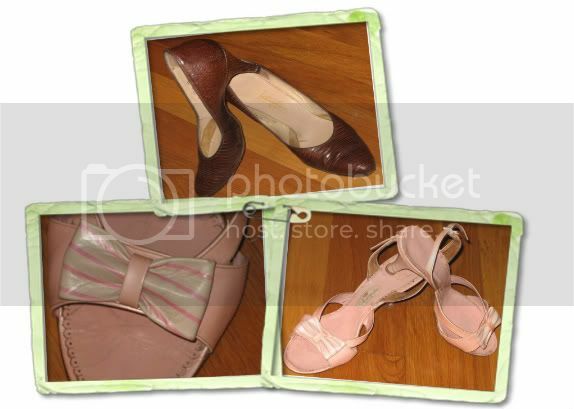 Here are the other shoes I found last weekend at the estate sales I went to. The top lizard pair were purchased at the same sale as the brown suede ones, also only $2.50. The pink ones were purchased at a different sale that same weekend, $5. This sale was super!!!! I got a vintage quilt with turtle appliqués on it for only $5 and it is in super condition and will fit a twin size bed. I also got a really great 40's suit jacket and a cute home made 50's blouse and skirt. I'm really enjoying the fall weather here.....definitely my favorite season for sure! What yours? ***OH! I forgot to add in my last post something important about keeping out smells. Heat will bring out the smell of B.O. in clothes so I always wash in cold water and line dry. I may have mention before just how much I love doing laundry. I really find enjoyment from seeing something that is stained blossom into something clean and completely wearable. This past weekend I attempted something I have never tried before and it was very successful! I thought I would share my tips for safely removing unsightly odors from vintage clothing. For removing slight odors such as stale smoke, moth balls, and just overall smell from years of storage, I recommend Borax. It been around since 1891 and because of that I feel it's good to use on vintage clothes, since it more than likely was used on the clothes years ago. I also like it because it's natural. I tried it out for the first time a few days ago on a few new items of vintage clothes that had light odors and light stains. I must say, I was greatly impressed. I followed the directions on the back of the box for deodorizing baby clothes and it worked wonderfully. I always do a follow up of a swish in water that has a little bit of Gain softener in it to give the items the fresh laundry smell and to make them soft. A word of caution: I have read online and my mom has warned against using Borax with other cleaners (such as Shout or OxiClean) other than the laundry detergent because it can have a chemical reaction. The few times I have used it, the directions on the back proved to work the best. This next tip is my new absolute favorite discovery. 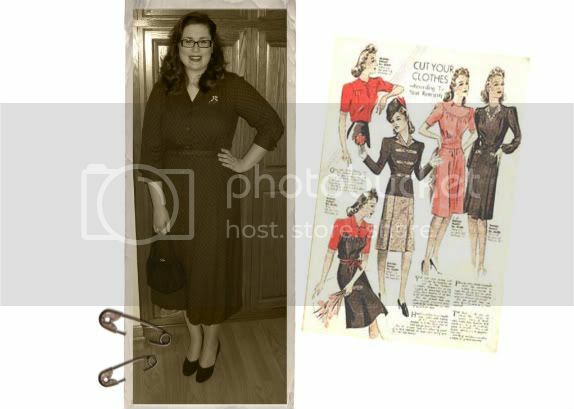 A few days ago I found this really great late 40's dress at Mother Fletchers for a steal; the only problem was it reeked of B.O. 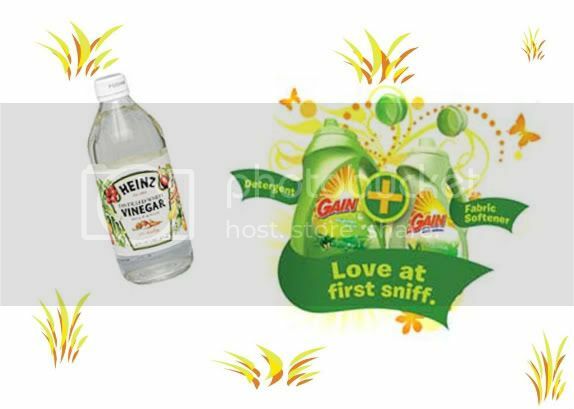 I had read online on a few different question and answer forums that vinegar would remove the smell. I was a bit skeptical but decided that this dress was the prefect candidate for the experiment. 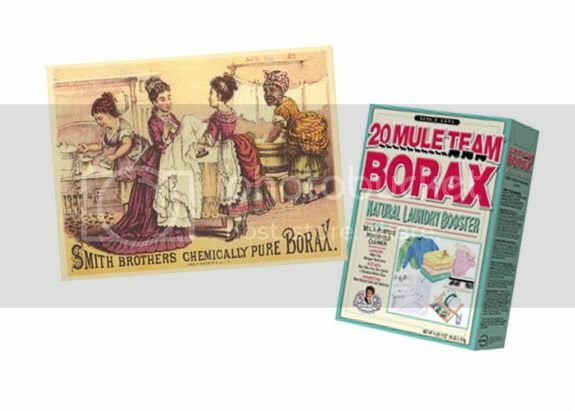 I first tried the Borax because I wanted to test it up against a tough B.O. It did work to slightly remove the smell, but it still was very overpowering. I made sure that I rinsed the dress well because of the acid-base mix between the Borax and the vinegar. After rinsing, I made sure the dress was damp, not sopping wet. I read that a solution of 2 parts water and 1 part vinegar worked well in a spray bottle. I mixed up the water in vinegar and sprayed it all over the dress, focusing on the spots were the B.O. was the worst. I let that set in for a few hours, hanging in a cool, dry place. Then, without rinsing, I placed the dress into a tub of water with Gain laundry detergent in it. (I prefer the original scent) I let this soak for the rest of the day and over night. The following afternoon I rinsed out the dress and rolled the water out of it with a towel and hung to dry. When I went to smell the dress today after it was all dry, I was was amazed that the smell was completely gone. There was also no fading to the dress either. 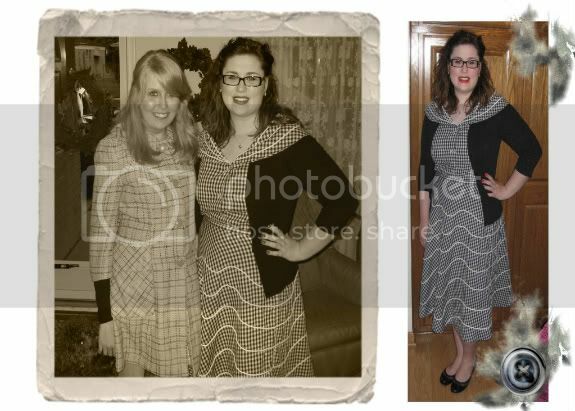 I was sooooo happy that this worked because I had purchased a dress of eBay and it arrived with a B.O. smell. I was so disappointed because I always make sure and ask before I buy any clothing items online. (The seller said it didn't have any odors). So now that I know this works, the next time I find a great dress I won't shy away from it just because it smells!